Update: This Discussion post includes information about a new scam that has been recurring the in Classifieds, and additional tips about what you can do to protect yourself. Hello, How are you doing today, hope everythings is alright, am interested in immediate purchase of your item, After several consideration over the advert placed on the ad, i am really interested in it, let me know the present condition of the item and the total amount, payment shall be via Money Order or Cashier’s Check. Send me your full name and address and phone number and total amount of the item so that payment can be issue asap, be inform that the item will be pick-up by my shipping agent after the check clears in bank okay, so get back to me asap thanks. • seems to be in a rush to purchase the item. The message is also written in broken English, but not all buyers who struggle with English are necessarily suspicious buyers. Not all scams are as easy to recognize as the one above. Some scammers try to make a better impression by using coherent text and images that have been copied from other sources, such as auction sites or earlier classified ads. These scammers may even post a few remarks in the Discussion at Briar Press in an attempt to appear legitimate. Their scams can be difficult to spot. Here’s an example of a scammer’s profile page. 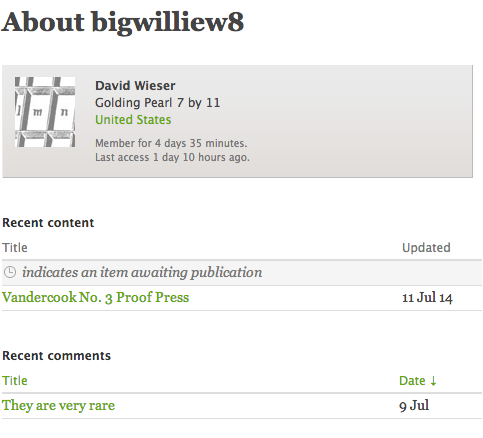 Note that the username, bigwilliew8, does not appear to relate to the user’s first or last name, David Wieser, which is probably fabricated. The single, generic comment, “They are very rare,” was posted in Discussion to suggest legitimacy. What can you do to avoid becoming a victim of a Classifieds scam? Look for discrepancies in the way the seller types his or her name, and Google the name and/or email address to see if any discrepancies emerge. Run a Google image search on any images provided. Sometimes scammers reuse images that Google can identify as duplicates. Find out what you can about the seller by clicking on his or her username. A seller who joined Briar Press yesterday may not be a scammer, but members who have an active history here are more likely to be trustworthy. Scrutinize the email correspondence you receive from the seller, and try to speak with the seller on the phone. Be very wary of strange communication and unusual shipping arrangements. Don’t be tempted to respond to suspicious offers. Individuals who contact you through Briar Press will never see your email address unless you respond directly. Instead, forward the entire email message to spam [at] briarpress.org. Please do not cut and paste the correspondence regarding the ad into a new email. Without the entire email message we may not be able to take appropriate action. We immediately ban users who send suspicious offers or abusive messages to our members.